Cambridge Arts Festival began in September 1995 and has been an annual event held in Cambridge every summer. We are a fully not-for-profit event that provides attendees with a FREE day of interactive arts activities, live music and performance, artist and vendor market, Cambridge’s largest Maker Lab event, and much more! Celebrate Original Art – by providing a space for local visual artists, musicians, performers, and makers to share their talents with Cambridge and the surrounding communities. Inspire Appreciation for Arts and Culture – by building awareness of the wide range of artists in our communities and inspire participation in the arts. Build Community – by encouraging local arts organizations to become partners with and participate in the festival. Innovation – by continually seeking out new and creative ideas in arts and technology that can be shared with the community. 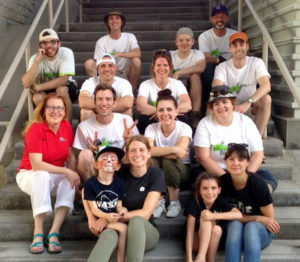 Build Environmental Awareness Through Arts – by providing attendees of all ages with the opportunity to learn about environmental responsibility through creative arts activities. 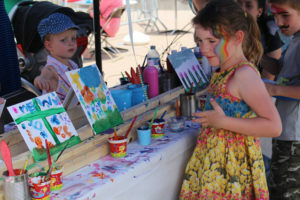 Each year, CAF hosts an exciting variety of arts activities for children. 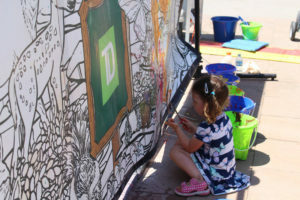 Yearly favourites include our Children’s Activity Passport, face painting, colouring stations, balloon art, and sidewalk chalk. In 2014, CAF introduced children to the art of creating with recycled materials such as newspaper hats, tin can and pop bottle jet packs, and berry box backpacks. These were a great hit and in 2017, we plan to introduce even more creative activities that bring awareness to the concept of “reuse, reduce, recycle” and to the environment. CAF’s Art Market lines over two blocks on Dickson Street as well as booths throughout the festival area. Artists display their work in the mediums of painting, drawing, sculpture, photography, mixed media, street art, and more. In 2016 we welcomed over 50 artists and merchandise and food vendors. A new initiative in 2017, CAF Collective is a group of Cambridge-based artists who have come together to create an interactive art installation that attendees can participate in on the day of the festival. An exhibition of the members’ independent works will also be on display. 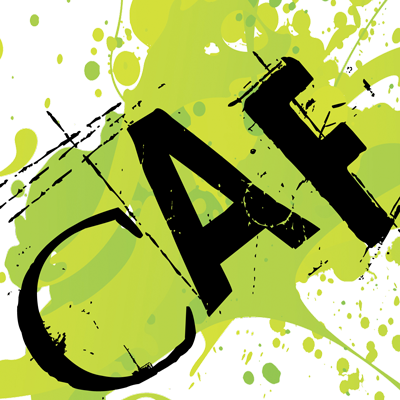 CAF Collective is funded in-part by Arts Connect Cambridge. 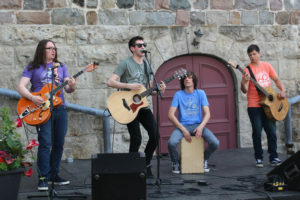 From rock to folk to jazz and more, our main outdoor music stage hosts a variety of well-known and up-and-coming local musicians to entertain music lovers of all ages. Popular children’s acts also perform during peak children’s hours. 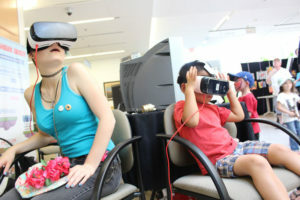 CAF is the founder and host of Cambridge’s largest Maker Lab – where arts meet technology with creative activities for makers of all ages. Established in 2014, our Maker Lab has now become known throughout the region. This year, the Maker Lab is growing with even more creative technology and environment themed activities including: robot assemblage, interactive video art, 3D printers, simple circuits lab, Bot Brawl and more! 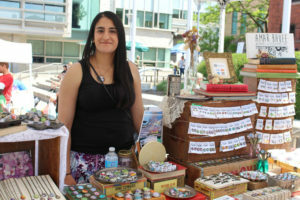 Each year, CAF invites local groups to participate in the festival to help bring awareness to the great organizations that are right here in our communities. In 2016, CAF welcomed Idea Exchange, Cambridge Live Music, the Fashion History Museum, Cambridge Centre for the Arts, Cambridge Army Cadets, Preston House Scout Band, Long & McQuade Musical petting zoo, and an indoor art exhibit from Highland Public School among others. CAF strives to cultivate relationships with sponsors and we continue to enlist support from the Region’s local businesses to help make the arts a priority in our communities. 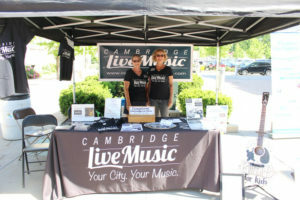 While the City of Cambridge is our main funder, we are proud to receive support from TD Bank, Waterloo Region Record, Cambridge Arts Connect, Cambridge Farmer’s Market, Josslin Insurance, Angus Audio, as well as many other local businesses and organizations who donate to our silent auction. The number of supporters for CAF grows annually. The Cambridge Arts Festival Planning Committee consists of a small team of dedicated volunteers who work hard all year round to make the event a success. Over the last 5 years, attendance at the festival has more than doubled and we consistently hear positive feedback from attendees about how much they enjoyed the festival. Our committee is strong with many members having served with the festival for 4 years or more. Every year, we undertake a thorough evaluation of our programming so that we can create an even better experience for future events. In 2015, Cambridge Arts Festival received a Bernice Adams Award for making a significant contribution to arts in culture in the City of Cambridge. In 2016, CAF was nominated for a Region of Waterloo Arts Award for its outstanding accomplishment and service in the field of event production.